After two-time Actor® recipient John Slattery opened the 16th Annual Screen Actors Guild Awards® arrivals with the traditional Champagne Taittinger toast, film and television’s finest performers walked the SAG Awards red carpet outside the Los Angeles Shrine Auditorium under the shelter of a massive translucent canopy, erected to ward off the threatening storms which had happily subsided well before the day’s activities commenced. SAG Awards nominees and presenters visited with media from around the world, posed for photographs, greeted cheering fans and stopped to chat with the hosts of “TNT and People Magazine Present THE SCREEN ACTORS GUILD AWARDS RED CARPET SHOW,” telecast live on TNT and webcast live on tnt.tv and tbs.com. After traversing an ivory silk-lined tunnel, SAG Awards guests emerged to find their tables in a sumptuously appointed showroom whose design combined repurposed as well as new elements in the SAG Awards ongoing commitment to a “green” production. In keeping with the glamour of the evening, the ceremony’s production motif harkened back to the opulent theatres and movie palaces of the past. Gold leaf and copper accents set against deep platinum walls and an ebony floor emphasize such architectural details as fluted columns, elaborately carved cartouches and geometric-patterned glass, while at center stage a gold-framed silver screen against a twinkling background showcased the nominated performances and tributes that are the essence of the evening. A custom-made deco crystal chandelier punctuated the stage lighting and was echoed in multiple overhead fixtures throughout the showroom. Table linens in platinum and gold bisque silk set off Lucques catering’s beautiful antipasto plate, created from sustainably produced ingredients. Guests enjoyed a 10th Anniversary Cuvée specially bottled by Dry Creek Vineyards in honor of its 10th anniversary as the SAG Awards’ wine sponsor. Continuing the sixteen-year tradition of saluting the Guild’s membership, Jane Lynch introduced a spirited film montage that reveled in actors’ comic gifts. Sigourney Weaver introduced a filmed “In Memoriam” tribute to the actors we have lost in the past year. Sandra Bullock presented the Screen Actors Guild’s highest honor, the Life Achievement Award to Betty White, following Bullock’s teasing introduction, a loving filmed salute and an enthusiastic standing ovation. Ever the comedienne, White returned Bullock’s ‘roasting’ and then some, in her delightfully saucy and sweet acceptance speech.  SAG Awards Committee Chair JoBeth Williams and Committee Member Scott Bakula revealed this year’s SAG’s Honors for the outstanding performances by a stunt ensemble in television and film, from the SAG Awards red carpet, preceding the Actor® awards ceremony. The announcement was carried on tnt.tv and tbs.com’s live pre-show webcast. PEOPLE magazine and the Entertainment Industry Foundation (EIF) celebrated actors’ charitable endeavors for the fourteenth year by making a generous donation to the SAG Foundation and by hosting the official SAG Awards Gala on the backlot of the Shrine. Blue-green birch walls and draped fabric ceiling, complemented by floating globes holding purple hydrangeas and orchids, created a soft backdrop for the guests who poured into gala from the adjoining showroom to congratulate each other and enjoy Wolfgang Puck’s scrumptious buffet. The inviting grey leather seating, which along with the cobbled green tables and bronze tuffets had been recovered from 2009 in keeping with the SAG Awards green initiative, promoted conversation, while this year’s Saturday night schedule enabled partygoers to dance on late into the night, sparked by a lively performance by Uncle Kracker.